With the month of January behind us and February in full-force, it’s time to prepare for Valentine’s Day for you and your special someone! 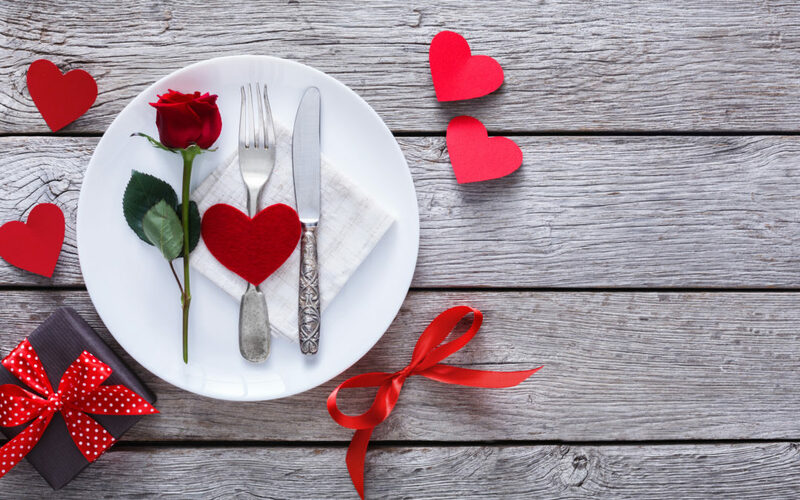 Let’s leave behind the chocolates and teddy bears and impress with a romantic, four course Valentine’s Day dinner that will be sure to dazzle your date. With Ream’s Food Stores fresh ingredients and affordable prices, cooking up a romantic Valentine’s Day dinner has never been easier! Read the recipes below to make a romantic (and impressive) four-course meal for you and your special someone! The saying “first impressions matter” hold a lot of weight when it comes to the appetizers. They set the mood for the rest of the dinner. If the appetizers are good, the rest of the food is sure to follow! Try these yummy stuffed tomatoes for your Valentine’s Day dinner. They’re perfect to start the night off right and it doesn’t hurt that the tomatoes are a beautiful bright red – the color of love. Follow these instructions to make the stuffed tomatoes. Every dinner needs a fresh element. Maybe this is so we don’t feel bad for indulging in rich and descendant foods later in the evening! This arugula salad will be sure to brighten up your dinner plate as well as cleanse your palate for the upcoming main entree. It’s simple and light – exactly how the atmosphere should be with you and your date! Follow these instructions to make the salad. The moment we’ve all been waiting for: the main course. You and your sweetheart will adore this delicious shrimp scampi recipe. With the flavorful fresh shrimp paired with mouth-watering pasta, this dish is going to make you and your sweetheart keep going back for more! Follow these instructions to make this pasta. Is it even Valentine’s Day if you don’t eat chocolate? This year, swap the box of chocolates for this decadent and indulgent chocolate souffle. You’ll be sure to impress your date when you pull one of these out of the oven. Relax with your sweetheart and revel in this delicious dessert. Follow these instructions to make this souffle.